Wanted to share this interesting incident from last evening. Within minutes, as always, he started talking. He said He teaches at various colleges and auto was just something he did on the side to add to his piggy bank. He mentioned Blogspot and that he was an artist keen on selling/promoting his art. I told him how to blog, what an email was and various ways of how he could get people from all over to get in touch with him. He kept asking queries on blogger, what is comments, and so on which i answered to the best of my knowledge. We were driving past MOP Vaishnav when he pointed out saying "i have taught here, and even been featured on their radio channel". I got curious and asked him what kind of art he was into. I asked if he painted, oil, canvas, etc and he instantly shook his head and said "i cant draw made, i am what you call a sculptor, except with paper". This piqued me interest, and i asked "origami?" He turned, grinned and said "you know Origami? well, i do Kirigami" I use scissors and made interesting pieces madam.. Do you know? I told him of how i was inspired by a friend and got interested in origami. He was damn kicked and spoke excitedly about Kirigami, how he is the only one in India to be in this space, the various interviews given to publications/magazines/websites and the TV channels that have featured him. At the Pizza hut traffic signal, he pulled out some sheets of paper- The Hindu, and another supplement from a tamil paper and showed me the interviews, but not before asking with a tinge of hesitation "you read tamil?" When i asked him to share his blog url, you know what he said "just google Kirigiami india madam and my name is the 1st.. i am known as Kagitha sirpi Ramesh". He is so eager to showcase the 4000 pieces he has created, but unable to find a sponsor. He has done classes pretty much all over the city, even at the ABK-AOTS DOSOKAI, Nelson Manickam road.. he says he wants to apply for a Guiness record, but there is so much red tape he is lost in the maze. He wants to teach more... he also wants to see if he can sell his creations not only to spread the joy of Kirigami, but also to earn some money. He has no knowledge of computers.. has a friend who runs a browsing center who manages his blog and email..
Is there anyway we can help him? one of his master pieces. PS: I have shared this on FB as well..
nugaluku matum engenthu ipdi autokaranga kedaikaranga!!! I've never heard of kirigami before but this post made it sound interesting. Nice post and thanks for teaching us a new form of art. Hi, first time here. I was intrigued by this paper artist. I had interviewed a paper artist called Prabal Pramanik for my paper Sunday Herald in '91, and he had revealed that this is a very old Indian art form called Devasthankala. I am giving the link here. He had been a struggling artist looking for patronage, but being also an artist, he has since made great strides. 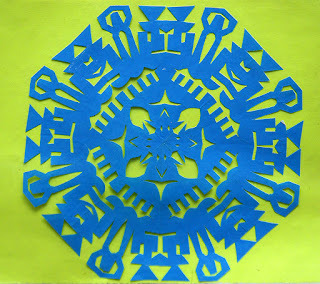 Maybe one day this Kirigami artist will become just as famous!